26 September 2018 ~ Comments Off on Our second single is coming! Our second single is coming! Hopefully you all had an incredible summer with lots of music and nice weather! We had an amazing time releasing Heads You Win, Tails We Lose and playing festivals all over Europe to spread our new single. But summer has come to an end and it’s time to bring you some fresh music and accompanying shows! 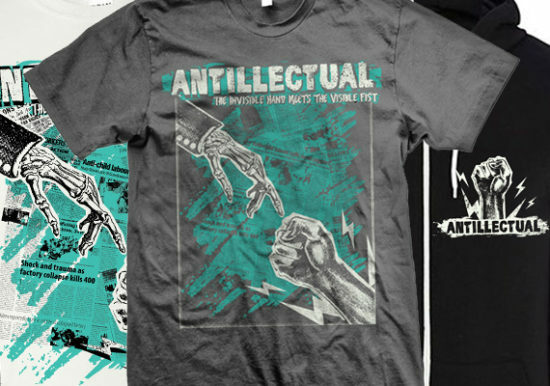 Starting now you can pre-order The Invisible Hand Meets the Visible Fist merch. Daggers Design created the artwork for the single and the merchandise. Pre-orders end on October 7! Previous designs are still available, including package deals with our 10-year anniversary album Testimony. Unfortunately we can’t give you any audio of the new single yet. But this might be a nice occasion to play our most recent single Heads You Win, Tails We Lose? Thanks for all heartwarming reactions to the song and our new “singles approach”!